I STAND TO HONOR THE PROMISE THE FLAG REPRESENTS. YOU KNEEL BECAUSE THAT PROMISE HAS BEEN BROKEN. I STAND TO AFFIRM MY BELIEF THAT ALL ARE CREATED EQUAL, AND TO FIGHT ALONGSIDE YOU FOR THAT PROMISE. YOU KNEEL BECAUSE TOO FEW STAND WITH YOU. I STAND BECAUSE WE CAN BE BETTER. YOU KNEEL TO REMIND US TO BE BETTER. I STAND TO HONOR ALL THAT HAVE FOUGHT AND DIED SO THAT WE MAY BE FREE. YOU KNEEL BECAUSE NOT ALL OF US ARE. I STAND BECAUSE I CAN. YOU KNEEL FOR THOSE WHO CAN'T. 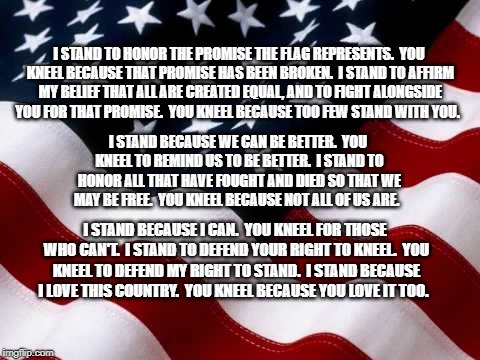 I STAND TO DEFEND YOUR RIGHT TO KNEEL. YOU KNEEL TO DEFEND MY RIGHT TO STAND. I STAND BECAUSE I LOVE THIS COUNTRY. YOU KNEEL BECAUSE YOU LOVE IT TOO.